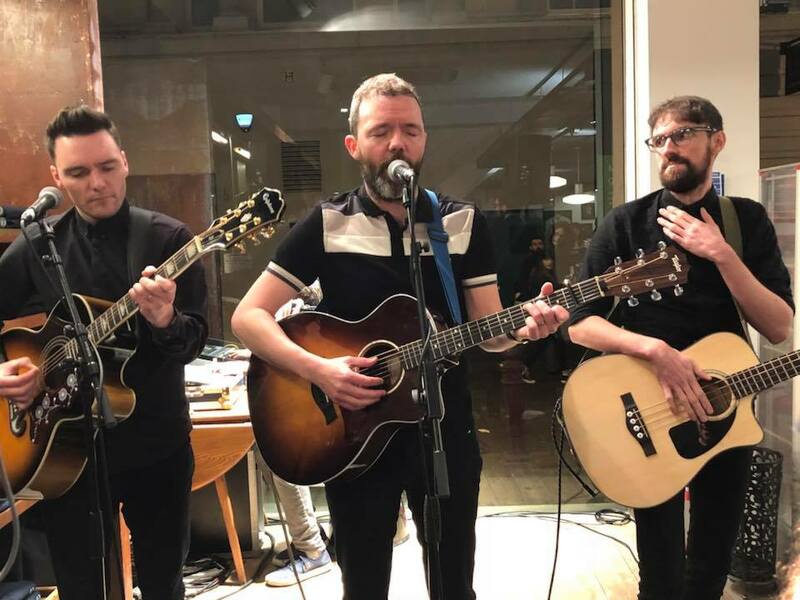 Just over a week after their triumphant Albert Hall sell out show a few hundred metres away, The Slow Readers Club played a seven-song acoustic set that is likely to be more intimate than anything they ever play again. 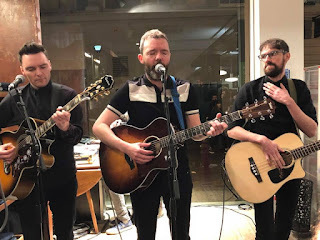 Aaron, Kurtis and Jim treated a crowd packed into Fred Perry's bijou Manchester store to a stripped down performance of favourites from across their two albums as well as recent single Lunatic. It's a strange situation for both fans and band after the former queued outside the shop before being allowed in to the generous offer of a few beers to celebrate the launch of Fred Perry's Annual Traditions range. Curious passers-by, many the worse for wear including one idiot who liked the sound of his own voice so much he thought it was more important than the performance, wondered what was going on, what the chants of "READERS", a bit more restrained than usual with the gap between band and audience being a few feet and a monitor. The band are on relaxed form, having come down from the euphoria of that sell-out show just over a week ago, and Aaron isn't even fazed by his two kids being down in the front row, joining in with the singing and clapping along to the set as it progresses to its climax of Forever In Your Debt and I Saw A Ghost, at which point there's a crowd assembled outside too to see what all the fuss is about. And that fuss is the same whether it be in Albert Hall or this clothes store. Songs like Cavalcade, Sirens and Block Out The Sun which open the set feel as personal in this much more naked environment than they do with the big sound system and light shows that form part of their stage set these days. Aaron jokes that it's the first time they've played Lunatic live so we have to forgive them if it doesn't work, but it does perfectly, showing off the impressive range of Aaron's voice to its full extent as well as Kurtis's oft-underrated backing vocals. Improvising with a tambourine and a box of Cavalcade CDs by Jim's foot or Aaron's guitar as a replacement drum, both Aaron and Kurtis play acoustic guitar and Jim acoustic bass. This allows them to drop in first album favourite and rarely played track Stop Wasting My Time, which despite the bright lights and the eye to eye contact between band and audience still feels as claustrophobic and dark as it does on the record. The crowd have let their down their inhibitions a little more by the time we reach that conclusion of Forever In Your Debt and I Saw A Ghost and Aaron's almost drowned out by the crowd. Even in this sparse surrounding the songs sound like huge anthems made for arena size venues. As the set finishes they stay around for photos, autographs and to chat to both friends and those who've stumbled into the store curious at what is going on. It'll be one of the last times they'll be able to be quite so generous with their time once their third album hits early next year. They play Glasgow King Tut's Wah Wah Hut (December 9), Hebden Bridge Trades Club (February 2) and Liverpool Sound City (May 5/6). With thanks to Rick and Jamie at Fred Perry.